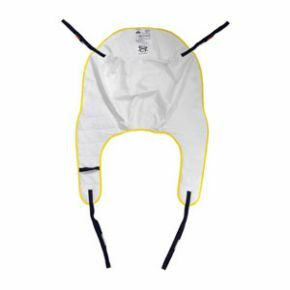 These updated disposable slings are constructed from a new Polyester material that offers a high level of strength, comfort and support. Padded leg supports have also been incorporated on both types of slings to achieve a more comfortable transfer. Comfort Padded sling which is connected to the 4 point cradle using the Securi 3 clip system but is not suitable for the standard 2 & 4 point spreader bar. Full Back sling - offering head support which is connected to the standard spreader bar via the loop fastening system but is not suitable for the 4 point cradle. Excellent service from "Active" and good quality of goods.